How to lift depression […fast] the human givens approach. ‘How to lift depression …fast’ shatters many myths. It provides clear guidelines, with case histories, for helping people get out of depression, even those at high risk of committing suicide. Just reading it can raise your mood and put joy, pleasure and meaning back into life, even in the bleakest of circumstances. We are all born with a rich natural inheritance — a partially formed mind containing a genetic treasure house of innate knowledge patterns. These patterns appear as physical and emotional needs that must be satisfactorily met if our minds are to unfold and develop to their fullest potential. How they connect with the world, and unfold in it, determines our own individual character, the clarity of our perceptions, our own and our family’s emotional health and happiness — as well as the maturity and humanity of the society we create around us. 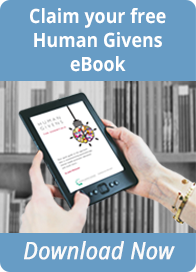 This book explores these human givens and looks at what each child and adult needs from the environment in order to develop well. It suggests that, as a society, we are unwittingly damaging or squandering our natural inheritance. This results in rising levels of mental distress, such as depression, anxiety, psychosis, addiction and an explosion of primitive greed behaviours. But Human Givens also explores startling new scientific ideas and findings about how the mind works, which show us that we can overcome these distressing conditions much more easily than previously thought.